Although it could be the way of the future, there’s something odd about plugging in your car. It’s like having a giant cellphone parked in your driveway, powering up. And that’s the biggest mental hurdle you need to leap when you drive a Chevrolet Volt—the way you’ve fuelled up your car since you got your driver’s license isn’t the way this machine works. Electricity is its prime propulsion method, not gasoline. When I first picked up the Volt from a Toronto GM dealer, I was told it was charged up and ready to go. When I got in the car, however, it was down to 20 km range on the battery (with another 360 km range in the supplemental 1.4-litre gasoline-powered engine.) After a couple stops, I was down to about 12 km on the battery. So, on my way home, I watched as the kilometres slowly ticked down on the battery display on the dashboard. There were no warning lights or alarm bells, just a matter-of-fact ticking down of numbers, 3, 2, 1 … and then, nothing. 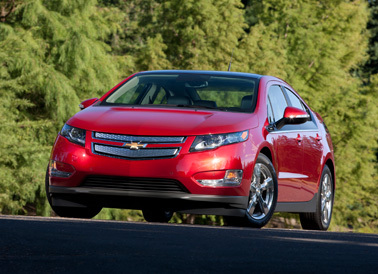 Seamlessly, the gasoline motor kicked in and the Volt and I kept moving. Had I not been watching the dashboard display I wouldn’t have noticed much except for a change in the engine note. Once the gasoline engine started it went from being nearly silent to sounding a like a small four-banger. Once I got home, I parked the Volt for a while and then later took it out on a few more short trips, at first feeling somewhat guilty for driving an electric car on a normal 20th century internal combustion engine. That’s when I realized what sets the Volt apart from gas/electric hybrids: the Volt’s gasoline engine doesn’t drive the wheels, it instead uses a small amount of gasoline to create electricity to keep the car going. When I plugged it in later that evening, it took about 12 hours to fully charge via a regular 120-volt household outlet (it doesn’t have to be fully depleted before being charged up). That’s not bad, but ideally GM engineers will work to reduce that time. GM does offer an optional 240-volt recharging unit that its says can charge the car in four hours. GM also claims that the Volt can run from 40 to 80 km on battery power alone, depending on cargo and outside temperature. My review model needed charging after just under 40 km following a single day of city driving. During those drives, however, several people stopped to admire the car, which, to GM’s credit, is a handsome machine. It’s also a cleverly designed hatchback that doesn’t look like a typical hatch. Four people can sit comfortably in front and rear bucket seats—the battery stack runs up the centre of the car, taking up some foot room and dividing the four seats. But there’s also a substantial cargo area behind the rear seats. The sloping front windshield and large rear window also provide excellent visibility. The console touch screen works well but some of the touch controls on the console can be tricky unless you hit them exactly right. Driving the Volt is a futuristic experience. Here’s hoping GM will be able to tweak the Volt’s battery to make that experience last longer.